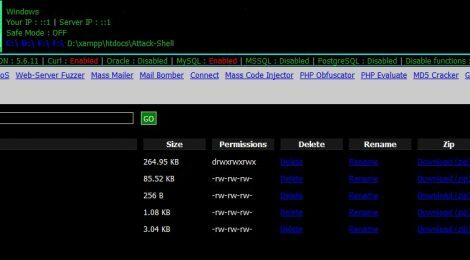 Browse: Home / Attack Shell is a PHP remote shell, basically used for remote access and security pentesting. Attack Shell a.k.a. Ani-Shell is a simple PHP shell with some unique features like Mass Mailer, a simple Web-Server Fuzzer, Dosser, Back Connect, Bind Shell, Back Connect, Auto Rooter etc. This shell has immense capabilities and have been written with some coding standards in mind for better editing and customization. * Fixed Some Coding errors! 1. Email Traceback is set to off as default and emails will not be sent. If you are setting this feature on, make sure you change the default email address (franzwagner.str@gmail.com) to your email address. Please change it before using! 2. Username and Password are set to admin and 12345687 respectively, please change them for better security. 3. The Lock Mode feature is set to on ! This should not be change unless you want your shell exposed. 4. The Anti-Crawler feature is set to off ! Change it to on for anti-crawler support. 5. A variable named greetings can be changed to change the Shell’s greeting message. Where config/ is the directory containing your php.ini file. ← AutOSINT – is an open source intelligence gathering engagements.